Mumbai, 11-November-2017: The Don Bosco Development Society (DBDS), Mumbai organized a one-day workshop on ‘Improving Nutritional Status of Women and Children’. 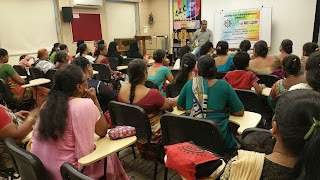 83 slum women from different Self-Help Group (SHG) in Mumbai participated in the workshop, supported by Salesian Pastoral Youth Services, Malta. Fr Rolvin D’Mello (Executive Director – DBDS) said, “In India we have the wonderful Public Distribution System under the Food Security Act. Through this workshop we want to explain to the women from the slums about their entitlements under the Food Security Act; so that they can demand them – and thus no one will ever go hungry”. Ms. Surekha Pednekar (Programme Coordinator - DBDS) welcomed the resource person, Mr. Mohamed Anees (President - Anna Hakk Parishad). He gave some wonderful insights and detailed information about the Food Security Act in relation to Public Distribution System existing in India. 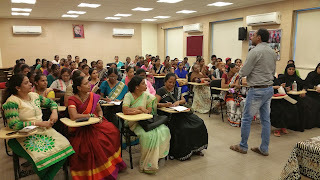 He further explained role and importance of nutrition in health of women and children by elaborating on different types of food to be consumed and to be avoided, which was a new revelation for all the participants. Mr. Anees also helped the participants to understand practically how they can access their entitlements under the Food Security Act. There were numerous queries raised by the participants which were answered satisfactorily. Mrs. Vaishali Kamble (a participant of the workshop) proposed the vote of thanks for the enriching workshop; thanking DBDS and Salesian Pastoral Youth Services (Malta).